Last time around I looked with admiration at the St. Nicholas Abbey 5 Year old, suggesting that in its unadorned simplicity and firmness lay its strength…it didn’t try to do too much all at the same time and was perfectly content to stay simple. It focused on its core competencies, in management-speak. 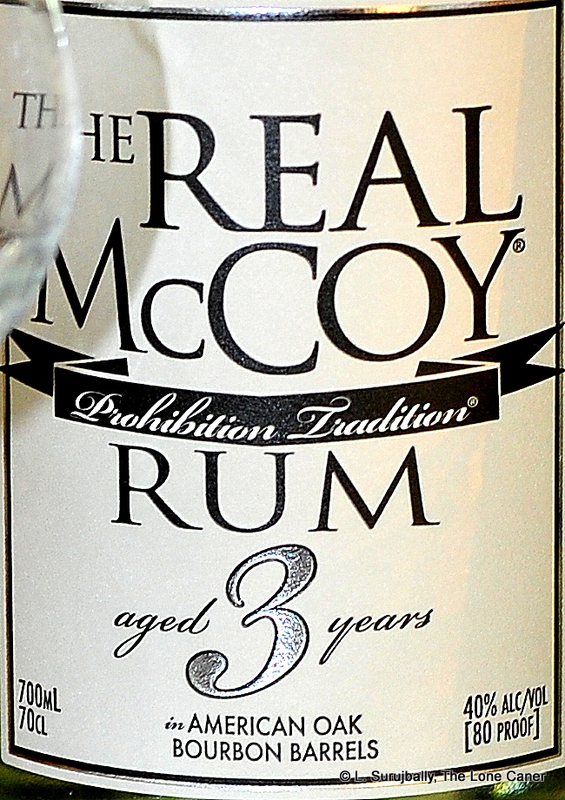 Yet that same day, just minutes apart, I also tried the Real McCoy, another Bajan five year old, and liked it less. 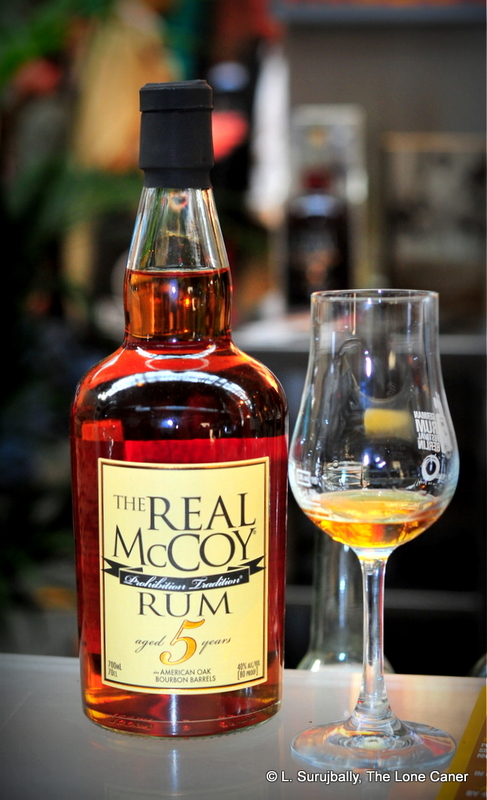 Since both rums are from Barbados, both are unadulterated, and both five years old, it must be the barrels and original distillate. As far as I know the St Nick’s is from their own pot still, and the McCoy from a blend of pot-column distillate out of Foursquare, and they both got aged in bourbon barrels, so there you have the same facts I do and can make up your own mind. 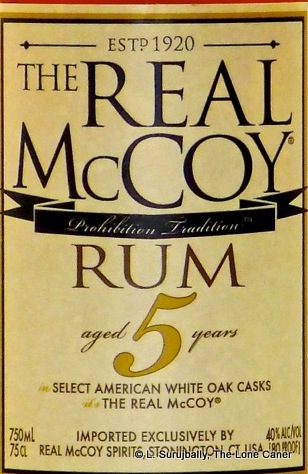 Just some brief biographical facts before I delve in: yes, there was a “real” McCoy, and as the marketing for this series of rums never tires of telling you, he was a Prohibition-era rumrunner who would have made Sir Scrotimus weep with happiness: a man who never dealt with adulterated rum (hence the “real”) didn’t blend his stuff with bathtub-brewed popskull and never added any sugar, and bought occasionally from Foursquare, back in the day. Mr. Bailey Prior, who was making a documentary about the chap, was so taken with the story that he decided to make some rums of his own, using Mr. Seale’s stocks, and has put out a 3 year old white, a 5 year old and a 12 year old. So here what we had was a copper-amber coloured 40% rum aged for five years in used Jack Daniels barrels, which presented a nose that was a little sharp, and initially redolent of green apples and apricots. It was slightly more aromatically intense than the 3 year old (which I also tried alongside it), and opened up into additional notes of honey, dates, nuts, caramel and waffles. The issue for me was primarily their lack of intensity. “Delicate,” some might say, but I felt that on balance, they were just weak. Similar issues were there on the palate. It was easy, no real power, and reminded me why stronger rums have become my preference. However, good flavours were there: cider, apples, citrus, sharpness, balancing out vanilla and vague caramels. There were almost none of the softer fruits like bananas or fleshier fruits to balance out the sharper bite, and this was reinforced by the oak which came over in the beginning (and took on more dominance at the back end)….so overall, the thing is just too light and unbalanced. This is what proponents of the style call genuine, what lovers of 40% Bajans will name “excellent”, and what I call uninteresting. Overall, and including the short, light, here-now-gone-in-a-flash finish, it displayed some of the same shortcomings I’ve associated with many younger and cheaper rums from Little England – there just wasn’t enough in there for me to care about. Leaving aside the stills, I’m at a loss to quantify the reason why the St Nick’s presented so much more forcefully than the McCoy given their (relative) commonality of origin and age and lack of additives. The McCoy five gave every impression of being dialled-down, and has too little character or force of its own, no indelible something that would single it out from its peers: the El Dorados for all their sugar at least have some wooden still action going on in there, the St. Nick’s is firm and unambiguous, and even the Angostura five has some aggro underneath its traditional profile But all we get from the McCoy is a sort of wishy washy weakness of profile and a failure to engage. Torque it up a little and we might really have something here…until then, into the mix it goes. Knowing how I have never been entirely satisfied with rums from Barbados, I decided to buy a few about which many have waxed rhapsodic, followed that up with trying as many as I could at the 2015 Berlin rumfest, and continued on the theme by begging my friends in Europe for samples of their personal stocks of independent bottlers’ Bajans. Let’s see if I can’t get to the bottom of why — with just a few exceptions — they don’t titillate my tonsils the way so many others have and do. 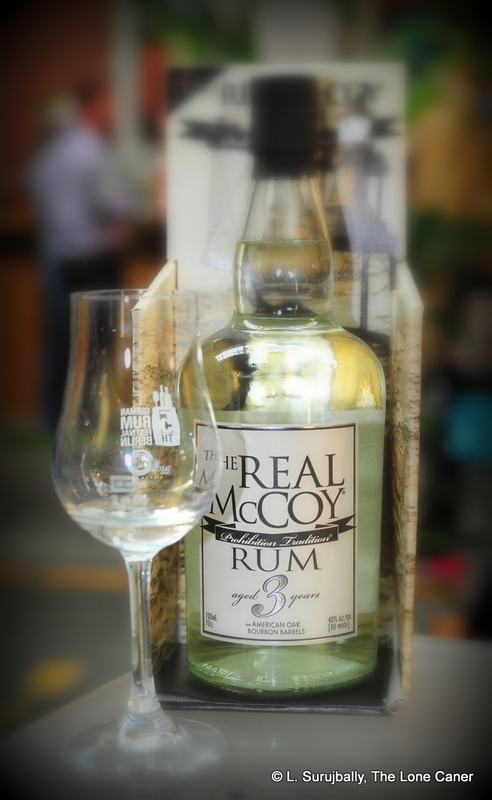 Such as this white three year old from the “Real McCoy” company, which is using stocks from Foursquare. Others have written about Bill McCoy, a Prohibition era rumrunner who never adulterated his stocks (some of which came from, er, Foursquare, according to a documentary made by Bailey Pryor). Apparently Mr. Pryor was so enthused by what Bill McCoy had done that he approached Richard Seale with a view to creating a modern equivalent: and after some time, the 3 year old white, a 5 year old and a 12 year old were out the door in 2014. This one is a blend of copper pot and column still distillate, 40% ABV, aged in American ex-bourbon oak, and an offering to bartenders and barflies and mixologists everywhere. Part of my dissatisfaction with filtered white rums meant for mixing was demonstrated right away by the aromas winding up through my glass: I had to to wait around too long for anything to happen. The nose was warm and faintly rubbery, with some faint tannins in there, sugar water, light cream,and a green olive hanging around with maybe three marshmallows. A flirt of vanilla loitered around in the back there someplace but in fine, I just couldn’t see that much was going on. “Subtle” the marketing plugs call it. “Pusillanimous” was what I was thinking. To be fair, a lot more started jumping out of the glass when the tasting started. It was crisper and clearer and firmer than the nose, a little peppery, more vanilla, cucumbers, dill, ripe pears, sugar cane sap. It’s not big, it’s not rounded, and the range of potential tastes was too skimpy to appeal to me. Skimpy might work for a bikini, but in a rum it’s a “Dear John” letter, and is about as enthusiastically received. The finish? Longish – surprisingly so, for something at 40%, though still too light. More sugar and dill, guavas and pears, and that odd olive made a small comeback. I’m sorry, guys, but this isn’t my thing at all. I want more. Perhaps it wasn’t such a good idea to kick off the Barbados tour with a filtered white 3 year old. It was thin, watery, too weak, and the tastes struggled to get out and make themselves felt. Maybe it’s the charcoal filtration that takes out some of what I like in my rums. The profile is there, you can sense it, just not come to grips with it…it’s tantalizingly just out of reach, and like the Doorley’s XO, it lacks punch and is simply too delicate for my personal palate. For its price point and purpose it may be a tough rum to beat, mind you, but my personal preferences don’t go there. And having had white rums from quite a few makers who revel in producing fierce, joyous, in-your-face palate shredders, perhaps you can understand why something this easy going just makes me shrug and reach for the next one up the line.